Jon Weisman is the author of 100 Things Dodgers Fans Should Know & Do Before They Die, as well as The Best of Dodger Thoughts. For more than 30 years, he has written about sports and entertainment for the Los Angeles Times, Los Angeles Daily News, ESPN.com, SI.com, Variety and other publications. Weisman lives in Los Angeles with his wife and three children.Joe Davis is the play-by-play broadcast announcer for the Los Angeles Dodgers on SportsNet LA. He also broadcasts college football, college basketball, and Major League Baseball on Fox Sports. Few franchises in any sport can match the tradition and lore of the Dodgers. The blue and white have been at the forefront of the game for generations, spanning the history books, the country and the gap between a mere sports team and a cultural icon. Still, to measure the true impact of the Dodgers, one only needs to see how they’ve mastered a 60’6” stretch of the diamond. 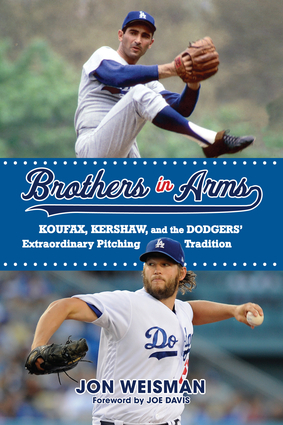 Brothers in Arms explores generations of Dodgers royalty and how they shaped the identity of the franchise. Weisman’s book brings together a thorough history of what makes the Dodgers unique, covering everything from the Brooklyn era to the 2017 World Series. No fan’s library is complete without this great new title.